Bradford High’s Mark Havers lost to Chance Marsteller of Kennard-Dale in York County 9-4 tonight in the PIAA Class Triple A wrestling championships in Hershey. Good luck at Clarion, Mark! Two juveniles are accused of breaking into a seasonal residence in Elk County and defecating on a sofa. Police say the two known juveniles from Brockport and Brockway broke into the camp on Bundy Settlement Road in Horton Township by breaking a window. Once inside, they defecated on the sofa then smeared feces on the walls. They also shot a window with a BB gun. The incident happened sometime between December 10 and today. Damage is estimated at $800. Police are continuing their investigation. 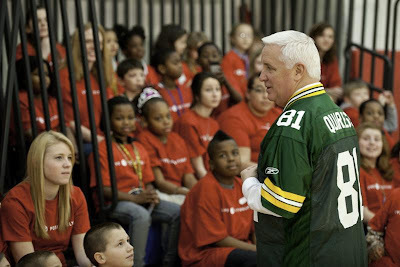 Pittsburgh – Governor Tom Corbett today fulfilled his friendly Super Bowl wager with Wisconsin Governor Scott Walker while helping to deliver a $25,000 check on behalf of Coca-Cola to the Boys and Girls Clubs of Western Pennsylvania and the Sarah Heinz House Boys & Girls Club. Because the Steelers lost the Super Bowl to the Packers, Gov. Corbett, a lifelong Steelers fan, appeared at the check presentation wearing a Green Bay jersey. “Although my beloved Steelers lost the Super Bowl, I’m happy to turn that loss into a win for the children of the Pittsburgh region who are served by the Boys and Girls Clubs of Western Pennsylvania and the Sarah Heinz House Boys & Girls Club,” Corbett added. A Mills, PA, man accused of firing a gun in an apartment while five children were present is facing another charge. Police say 36-year-old John Huggler was heavily intoxicated when got into to a fight with a 33-year-old woman on March 2 on Route 49 in Harrison Township. They ended up outside, where Huggler allegedly went into the road and disrupted traffic. He then allegedly got a rifle and fired one round into the ceiling of an apartment, when five children, ages 3 to 11, were present. Huggler was originally charged with discharging a firearm into an occupied structure, endangering the welfare of children, recklessly endangering another person and several summary offenses. The additional charge is illegal possession of a firearm, a second-degree felony. Huggler remains in jail on $100,000 bail. Bradford High’s Mark Havers beat Geno Morelli of DuBois 5-2 in the semi-finals of the PIAA state wrestling championships this morning in Hershey. 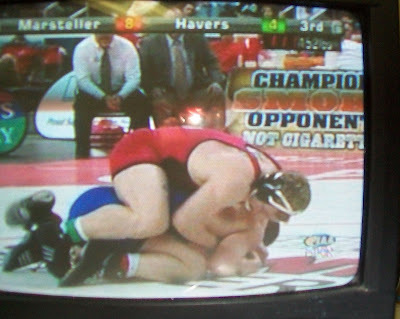 Havers goes for the state title tonight against Chance Marsteller of Kennard-Dale (York County). Marsteller entered the tournament undefeated at 38-0. Havers was 35-2 coming in to the tournament. Janice Holly Booth talks about "Only Pack What You Can Carry" here. Rudy Marxa talks about the new National Geographic book “100 Countries, 5,000 Ideas" here. Mireya Mayor is the author of "Pink Boots and a Machete: My Journey form NFL Cheerleader to National Geographic Explorer. Listen here. For more information, you can go to NationalGeographic.com/books. Remember, the Bradford Area Public Library is always an excellent source for information about any book. Route 98 in Great Valley is closed after part of the road collapsed on Friday. Cattaraugus County officials say when a portion of the hill on Route 98 between Sugartown and Martin roads gave way it caused 50 feet of the southbound section to collapse. They believe water run-off caused the collapse. No one was hurt. The road will be closed until further notice while officials decided what to do. Friday was an eventful day for Bradford City Police. Officers were called for a hit and run on South Avenue, an erratic driver on Route 219, road hazards at Mechanic Street and Walker Avenue, and on Elm Street. They had a vehicle complaint on Congress Street and parking complaints on Davis Street and Belleview Avenue, according to the complaint report and request sheet. Officers were called to a noise complaint on West Washington Street and harassment on Maplewood Avenue. They were also called for a report of harassment at Bradford High, alarms at Fretz Middle School and School Street Elementary. Police were also asked to help locate a parent of a GGB Elementary School student. The highly anticipated St. Patrick’s Day Party / Stop #2 for the Straub Brewery Charity Pub Crawl will be held at HoleShot Bar & Grill in St. Marys this Friday, March 18th from 9 - 11 p.m. All are welcome to attend and there is no cover charge. A Jam Session/Open Mic Night (HoleShot will provide the drums, mic, and amps) will follow Fish Fries (available all-day until 8 p.m). The St. Patty’s Day celebration will include HoleShot’s famous Roost Fries, $1 Straub Beer Draft Drink Specials, Free Door Prizes, official concert-style Pub Crawl tees for sale, and to really bring out everyone’s inner Leprechaun, special GREEN Straub Beer will be served throughout the party. Please note that Edgewood has also generously donated their parking lot for overflow parking at the party. A fugitive wanted in Bradford, Smethport and West Virginia is in custody after US Marshals picked him up near Towanda. 25-year-old Tony Ray Ford was wanted for allegedly sexually abusing a 4-year-old girl in November of 2009 in West Virginia. The McKean County Sheriff’s Office issued an arrest warrant on November 13, 2008, charging Ford with criminal trespass for breaking into a building. Bradford City Police issued a warrant on December 18, 2008. He was charged with making a false report to law enforcement. Ford was taken to the Bradford County Prison, based upon the felony charges in McKean County. Ford will also be charged as a fugitive-from-justice, and await court proceedings concerning his extradition to West Virginia on the first-degree sexual abuse case. It only took Bradford High's Mark Havers 14 seconds to pin West Allegheny's Aaron McKinney in the quarterfinals of the PIAA wrestling championships in Hershey this afternoon. He now moves on to the semi-finals, where he takes on Geno Morelli of DuBois. Good luck, Mark, from all of us at WESB and The HERO! Washington, D.C. – Leading aggressive oversight of the U.S. Department of Education, today during a hearing held by the Higher Education and Workforce Training Subcommittee, Congressman Glenn ‘GT’ Thompson prompted Inspector General Kathleen Tighe to further investigate allegations of improprieties within the Department of Education with regard to recently unveiled communications between the department and Wall Street about proposed regulations. Thompson submitted for the record a letter which cited a Freedom of Information Act (FOIA) request that indicates high level officials at the Department of Education were speaking to hedge fund managers regarding the release date of proposed "Gainful Employment" regulations for proprietary career colleges, many of which are publicly traded entities. A Cherry Creek man is facing charges after the toddler he was supposed to be caring for was found with a marijuana pipe in his hand. Sheriff’s deputies say they were assisting Child Protective Services at the home of 51-year-old James Howard when they saw the child with the pipe. They say a bag of marijuana and rolling papers were near the toddler. Howard was taken into custody and charged with endangering the welfare of a child and possession of marijuana. He will appear in the Village of Cherry Creek Court. The third suspect in the robbery of a pizza deliveryman, who is also a National Guard solider, is now in custody. Cattaraugus County Sheriff’s deputies and Olean Police found 18-year-old Travis Satterfield hiding in an attic in Olean at noon today. Satterfield, along with 19-year-old Hilario Maldonado Waskiewicz, Jr. and a 17-year-old, are charged with robbing Matthew Balcerzak Tuesday on Smith Hollow Road in Allegany. They got $28. For continuing, up-to-the-minute coverage go to CNN.com. The Westboro Baptist Church plans to protest at the funeral of the seven children killed in a fire earlier this week in Perry County, PA. In a news release, the church says the fire was a result of God’s wrath for Pennsylvania because the man who sued the church after they protested at his son’s funeral is from York, Pennsylvania. Albert Snyder’s son, Marine Lance Cpl. Matthew Snyder, died in 2006 while serving in Iraq. The Supreme Court recently ruled that the church can protest at military and other funerals. U.S. Senator Bob Casey says he's disgusted by the church's plan to protest at the funeral of the fire victims. “Westboro Baptist Church’s repeated exploitation of personal tragedy is disgusting," he said in a news release. "They have protested funerals of troops killed serving their country. Now it is targeting the funeral of children. The protesters should stay in Kansas and pray for the Clouse family." Suspicions were high in a few areas of Bradford late Wednesday and Thursday. City police got calls about suspicious vehicles on Russell Boulevard and Summer Street, and suspicious people on Williams Street. Officers also looked into a theft on West Corydon Street, motor vehicle accidents at Davis and Main streets, and at West Washington Street and Interstate Parkway. They received vehicle complaints from East Main and Congress Streets. Police got calls about a downed limb on South Avenue and a downed phone line on Edwards Street. They got several requests to speak with an officer, and assisted other agencies on a number of calls. Officers also got a report of a dispute on Barbour Street and loud noise on Bushnell Street, according to the complaint report and request sheet. The University of Pittsburgh at Bradford will hold the sixth annual Empty Bowls and Baskets Dinner of homemade soup and bread to raise awareness of the fight against hunger and to raise money for the Friendship Table. The dinner will be held from 5 to 7 p.m. Thursday, March 17, in the Mukaiyama University Room of the Frame-Westerberg Commons. Tickets are $10 and will be sold at the door. Diners are invited to take home a hand-painted ceramic bowl, handcrafted basket or hand-sewn cloth napkins as a reminder that someone else’s bowl might be empty. To date, close to $7,000 has been raised to benefit the Friendship Table. Dr. Holly J. Spittler, associate dean of student affairs and director of career services, and chairwoman of the event said the event is a community-wide effort. Dr. Assad Panah, professor of geology at the University of Pittsburgh at Bradford, was elected president-elect of the National Association of Academies of Science at the organization’s meeting in Washington, D.C.
Panah will serve a total of six years: two as president-elect, two as president and two as past president. It was the first time that anyone has been elected to a second term as president. Panah also served as president of the NAAS from 2003-04. The NAAS is a nonprofit organization that oversees a network of 47 state and regional academies of science affiliated with the prestigious American Association for the Advancement of Science, of which Panah is a fellow. In 2000, he received a Distinguished Service Award from the Pennsylvania Academy of Science, and in 2004, he received the same award from the NAAS. Panah is the director of Pitt-Bradford’s petroleum technology program, which he developed and launched in 2007. A Jamestown man who pleaded guilty to killing another man has been sentenced to 12 years in prison. 50-year-old David Scarpino pleaded guilty to manslaughter for beating and strangling Bruce Boje in 2008. In August of that year, firefighters responded to a blaze on Andrews Street in Jamestown. After they put out the fire, they found Boje’s body inside the house. District Attorney David Foley says this was a case of domestic violence, and should serve as a reminder for people in domestic violence situations to get help. The Natural Gas Expo at the University of Pittsburgh continues from 9 a.m. today. 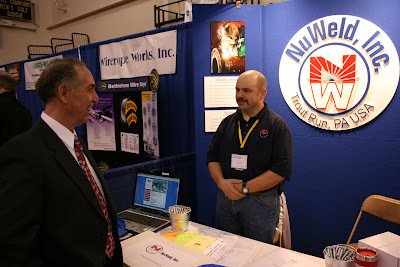 Pictured from Thursday, Dr. Assad Panah, left, director of the University of Pittsburgh at Bradford’s Petroleum Technology program, talks with Gene Hillyard of NuWeld Inc.; and Mitch Samuels of Electricord Manufacturing chats at the Natural Gas Expo held Thursday at the University of Pittsburgh at Bradford. 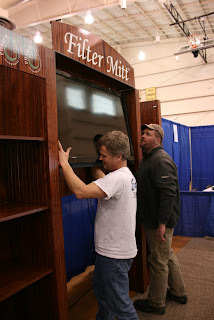 Electricord of Westfield in Tioga County, makes power distribution units for use in the field. 200 to 300 bodies have been found in the Japan coastal city where a devastating tsunami hit earlier today, following an 8.9 magnitude earthquake. The tsunami is hitting Hawaii right now. For continuing, up-to-the-minute coverage, go to CNN.com. ALBANY – With shocking new video evidence revealing continued violence in New York’s juvenile centers, state lawmakers are calling on Governor Cuomo to fire Office of Children and Family Services Commissioner (OCFS) Gladys Carrion, according to Senator Catharine Young (R,I,C – Olean). Security video footage, unveiled by former state Commission of Correction’s employee Eileen Carpenter at a recent press conference in Albany, showed graphic images of residents violently assaulting each other and staff in the state’s four juvenile secure centers. “I commend Ms. Carpenter’s courage for coming forward and exposing the truth about the violence that continues under Commissioner Carrion. This video confirms the chaos that has been created by her irresponsible policies,” said Senator Young. The nation’s first Sexual Violence Benchbook designed specifically to guide state district judges in the handling of the crimes of sexual violence is being distributed to more than 540 magisterial districts judges throughout the state, the Pennsylvania Supreme Court announced on Thursday. 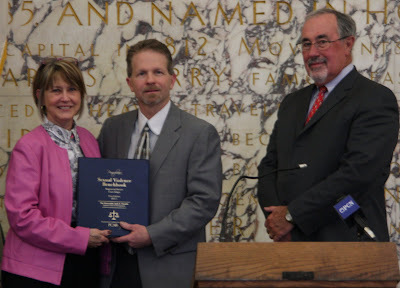 “The benchbook is a valuable resource for our front-line judges, a comprehensive guide providing ‘best practices’ and information to help district judges understand the intricacies and procedural requirements in these highly sensitive sexual offense cases,” Pennsylvania Supreme Court Justice J. Michael Eakin said. The two men accused of burglarizing a number of camps in Elk County between November and January were arraigned on Tuesday and are in Elk County Jail on $25,000 bail each. 26-year-old Daniel Aiello of St. Marys and 18-year-old Mark Aiello of Hazel Hurst are each charged with 66 counts of burglary, conspiracy to commit burglary and criminal mischief and 32 counts of theft by unlawful taking. They are accused of breaking into camps in Benzette, Fox, Jones and Highland townships. Police say victims of the crimes will be contacted as the investigation continues. The woman accused of stealing Edna Hallock’s purse from her Main Street office last month has waived her preliminary hearing. Bridgette Housler is accused of taking the purse that contained $3,000 while she was in the office asking about renting an apartment. Court papers say Hallock noticed the purse was missing shortly after Housler left the office. That day, Housler said she didn’t have enough money to rent an apartment. The next day she went back to Hallock’s office with $400 in cash for the rental. Court papers say Housler, her 3-year-old daughter and Corry Robinson then went to Erie and bought gas and 4 or 5 8-balls of crack cocaine (worth about $200). They also allegedly went to a couple of restaurants and rented a room at the Hampton Inn. Housler and Robinson are jailed on $30,000 bail each. Robinson’s preliminary hearing is scheduled for March 23. 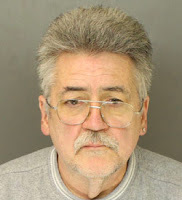 Agents from the Attorney General's Child Predator Unit have arrested a Lycoming County man accused of using Internet chat rooms to sexually proposition what he believed was a 13-year old girl, along with sending explicit webcam videos of himself to the "girl." Acting Attorney General Bill Ryan identified the defendant as George William McKay, age 61, of 723 High Street, Williamsport. Ryan said that McKay is accused of using an Internet chat room to approach and sexually proposition an undercover agent from the Child Predator Unit who was using the online profile of a young teen. During their first online communication, McKay allegedly told the "girl" that he was becoming aroused during their online chat and then used his computer webcam to transmit images of his exposed genitalia. Four of the Buffalo men arrested in the November drug bust in Bradford were in district court today. Charges of delivery and possession of a controlled substance against Quantrell Austin-Carson and Marquay Lee were bound to court following preliminary hearings in front of District Judge Dominic Cercone. Kennedy Gadley waived his hearing on the same charges. Delivery and possession charges against Kendrell Gadley were dismissed. A charge of conspiracy to deliver was bound to court. Lee and Kendrell Gadley are in jail. Austin-Carson and Kennedy Gadley are free on $12,500 bail each. The University of Pittsburgh at Bradford’s Petroleum Technology program will take part in the Natural Gas Expo: Cameron-McKean-Potter taking place on campus Thursday, March 10, and Friday, March 11. Students from the program, Beth Christman of Bradford and Ron Green of St. Marys, will be located in Booth #19 with information about the program. They and program director, Dr. Assad Panah, professor of geology, will also be available to talk with patrons at the expo. Panah teaches courses in both the Geology of Marcellus Shale and Hydraulic Fracturing, among others. “It’s a very strong program. We have a good reputation in Pennsylvania for the quality of the courses we offer in the Petroleum Technology program,” he said. Currently, the program has 32 students. Other petroleum technology students will attend the expo to speak with vendors and attend seminar presentations. 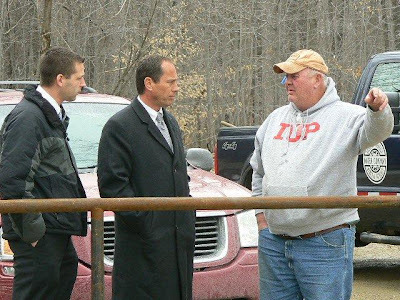 State Senator Joe Scarnati and State Representative Matt Gabler recently visited a Marcellus Shale drilling site on the Brockway Watershed. The two legislators were given a first-hand look at issues dealing with drilling close to municipal water sources. A former teacher of accused killer Waide Nolf testified during a hearing this morning about his cognitive abilities. Patty Sanfilippo is a former special education teacher for the Bradford Area School District. Judge John Pavlock ordered that the Commonwealth has 20 days to submit an amended expert report on Nolf's cognitive abilities and, if needed, the defense has 20 days after that to file an amended expert report. Nolf is accused of drowning 24-year-old Tonya Haight and 3 ½-week old Tamara Haight on March 19 of last year in the Pleasant Street house they shared with several other people. McKean County District Attorney Ray Learn is seeking the death penalty. Tuesday was the last day to circulate and file nominating petitions for the May 17 primary election – and some history may have been made by who did not file. For the first time in recent memory, an incumbent Bradford mayor -- in this case Tom Riel -- is running unopposed in the primary. Others, however, do have opposition. Michele Alfieri-Causer, Tony Alfieri, Tony Clarke and Chris Hauser are all running for the second county judge position. In Foster Township, John Sullivan and BJ Campbell are running to fill the unexpired term of Bob Slike. That's for 2 years. Dale Phillips is running unopposed for the 6-year seat. (CNN) -- Seven children died in a fire at a farmhouse in rural Pennsylvania while their parents were elsewhere, state police said Wednesday morning. For more on this story go to CNN.com. McKean County Commissioners Joe DeMott, Al Pingie and Judy Church attended Tuesday's Bradford City Council meeting. DeMott thanked council for helping to change the organizational structure of Bradford Regional Airport. You can listen to DeMott's comments here. Mayor Tom Riel thanked the Department of Public Works for keeping the city's roads ice-free during last Friday morning's brief ice storm. He said of the six accidents reported, none were on city-maintained roads. Riel also talked about the pothole situation in the city. Three men have pleaded not guilty to robbing a Yorkshire restaurant at gunpoint in January. 24-year-old Paul Andolina and 22-year-old Cory Roper, both of Delevan, and 22-year-old Christopher Roper of Jamestown are accused of going into The Shop restaurant at 9:20 on the night of January 6 with a shotgun and demanding money. Andolina is also charged with criminal use of a firearm. All three men are in Cattaraugus County Jail awaiting further court action. 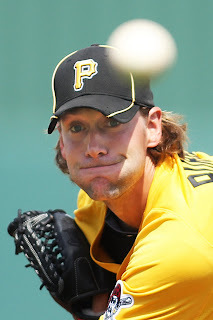 The Pittsburgh Pirates got a come-from-behind 5-2 victory over the Minnesota Twins today. Lyle Overbay tied the game at 2-2 by leading off the seventh with his second home run of the spring. Pitcher Brian Burres started for the Bucs and retired the side in order in his two innings of work. He has allowed just three hits in six innings this spring. The Pirates are 6-6 in Grapefruit League play. Senate President Pro Tempore Joe Scarnati voted in support of legislation that would allow law-abiding citizens to defend themselves without retreat and with potential lethal force providing their life is in danger. The bill passed the Senate today with a 43-4 final vote. According to Scarnati, under current law citizens have the right to defend themselves in their homes. However, they must show retreat outside their home when facing the danger of lethal force. This expansion of the ‘Castle Doctrine’ provides that individuals in any place they have the right to be can defend themselves, or love ones, when in significant danger. Today, Governor Tom Corbett presented his 2011-12 budget to the state legislature – a budget that is balanced and does not raise taxes for the residents of Pennsylvania. Specifically, the new, $27.3 billion budget focuses on improving four key elements: fiscal discipline, free enterprise, limited government and reform. 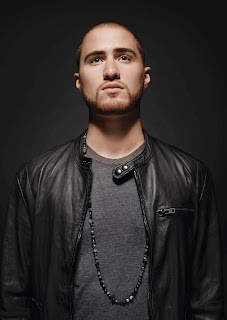 Pop and hip-hop singer and songwriter Mike Posner will perform in concert at 8:30 p.m. on Tuesday, April 5, at St. Bonaventure University’s Reilly Center Arena. The doors open at 7:30 p.m.
Tickets for the general public are $15 and go on sale Thursday, March 10. Tickets for St. Bonaventure students, faculty and staff are $10 each (limit one per SBU ID) and go on sale Wednesday, March 9. Posner launched his career at Duke University, where he balanced his undergraduate studies in sociology and business with his interest in writing and performing music. He began making melodic pop-rap songs for the college crowd and he compiled several mixtapes, the first of which, “A Matter of Time,” climbed to No. 1 on iTunesU in the summer of 2009.